Your institution is invited to participate in the 2019 Nebraska Spring College Fairs to be held Sunday, April 7 in South Sioux City, Sunday April 14 in Omaha, and Sunday, April 28 in Lincoln. 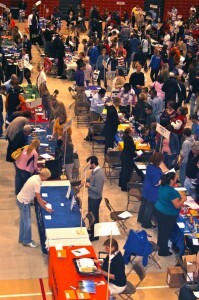 Hundreds of Nebraska sophomores, juniors, seniors, and their parents attend the fairs to find colleges that meet their needs. Complete the registration form before Friday, February 15 to be included in promotional materials. You may register after that date, but attendance will depend on space availability. Note:This form works best in IE10 or higher, or any other browser. To cancel your registration and receive a full refund, notify Nancy Price via email at least 30 days prior to the first fair you are scheduled to attend. There are no partial refunds if you plan to attend other fairs during the Spring season. A refund will not be issued if a fair is canceled due to inclement weather.